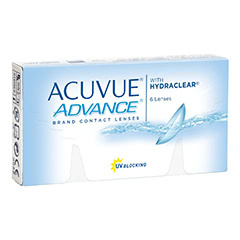 ACUVUE ADVANCE contact lenses are among our most popular two-weekly lenses, offering exceptional comfort and clarity. Advanced Hydraclear technology helps to keep your eyes moist and healthy, which is important for a long-lasting, comfortable experience. 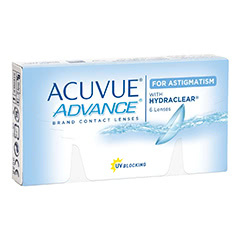 ACUVUE ADVANCE for Astigmatism is also available for those who need toric lenses. These lenses also feature UV technology, which has been incorporated to offer protection for individuals who spend a lot of time outdoors. At Lenstore.co.uk, we are dedicated to providing top quality contact lenses that suit the needs of various lifestyles. With Lenstore.co.uk, you'll not only enjoy excellent prices, but also super fast UK delivery. With over 90% of orders dispatched in one working day, you can be sure you'll get the lenses you need as soon as possible.